1987 was a simpler time. Ronald Reagan was in office, and Double Dare had just premiered on Nickelodeon a year earlier. 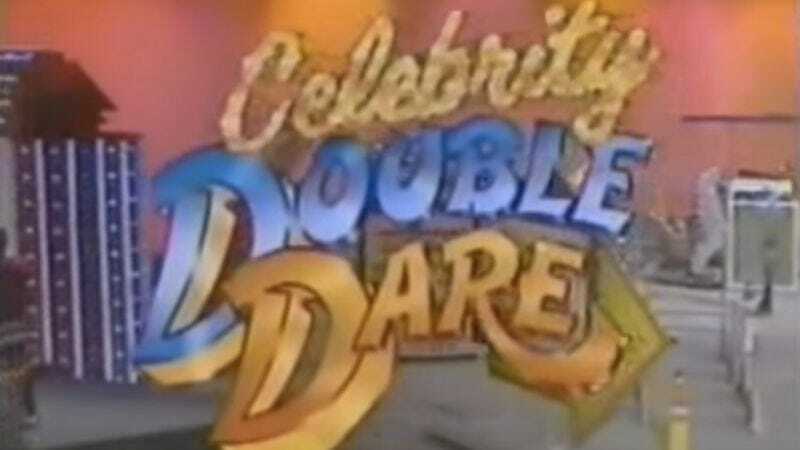 It was around that time that the Double Dare creators decided to see if they could spin their show off into an older, Hollywood-friendly version. Thus, the Celebrity Double Dare pilot was created. It never saw the light of day, save in smoky screening rooms, but thanks to big time game show fan (and onetime A.V. Club interview subject) Chad Mosher, it now exists on YouTube for all to enjoy. The show, hosted by Caitlyn Jenner, then known as Bruce, is a hazy exercise in sloppy awkwardness. Contestants include Hotel star Heidi Bohay and Jenner’s fellow alt-right agitator, Charles In Charge icon Scott Baio, who spends most of the episode making hokey jokes and trying to use Double Dare obstacles to prove his athleticism. One place where Celebrity Double Dare really outshines regular Double Dare is in its prizes. The obstacle course in particular has all sorts of great-at-the-time prizes, from a jukebox to a Mustang convertible and an African safari. The obstacles are decidedly more low-rent than actual Double Dare—there are Solo cups, orange cones, and a swimming pool slide involved—but it’s just a pilot, so what do you want, really? It’s all good fun, provided you don’t spend any time thinking about what a total shitbag Scott Baio has become in the years since.